Life Before the Dinosaurs: Charnia. Charnia (char-NEE-uh) was an Ediacaran sea pen-like animal which is named after Charnwood Forest in England, the place where it was first discovered. Charnia was first thought to be a Cambrian alga, but now it is believed to be a mysterious Ediacaran animal. Even though Charnia resembled a sea pen, it probably wasn't a sea pen. Charnia was a fractal animal, so it couldn't have developed organs that animals alive today have. 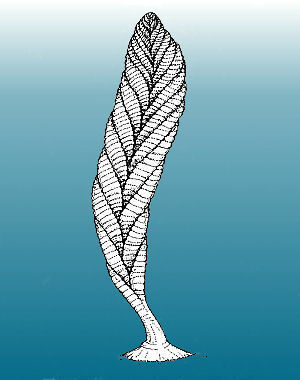 Charnia probably lived anchored to the sea floor with its holdfast. Charnia may have either absorbed food through its body or it could have been a filter feeder. Charnia is one of the oldest known animals. 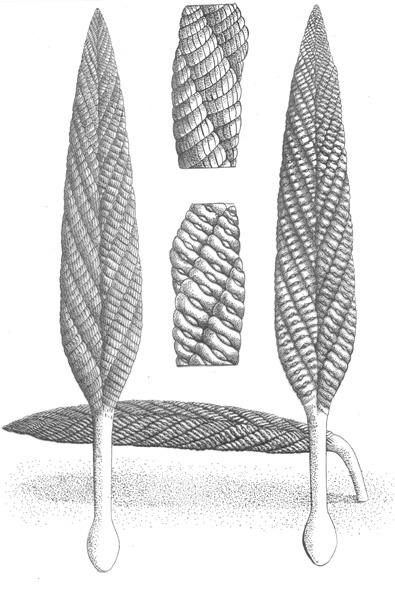 Charnia was the first fossil ever found in Precambrian rocks. Before Charnia was discovered, scientists used to believe that there were no Precambrian fossils, or possibly no Precambrian life. How do they know it was an animal and not a plant? This is a brilliant blog by the way, it’s hard to believe you're so young! I think Charnia is more likely to be an animal because at the time Charnia was around, plants were microscopic algae. And also that if Charnia lived in deep water, which is what scientists think, it could not have been a plant because it would not have had sunlight and couldn't photosynthesize like plants do. But nobody knows for sure what Charnia really was. It could still be a colony of polyps like a seapen, with tentacles that got lost during fozilization.